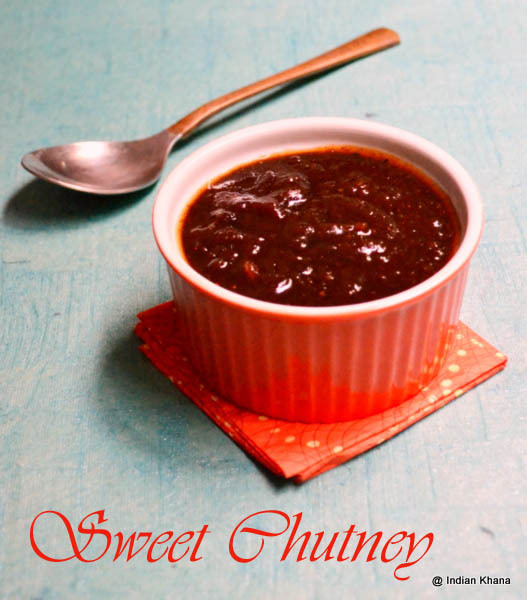 Sweet chutney or Imli ki chutney is one that I absolutely love after green chutney, it’s used for all most all the chat times, dahi bhallas, samoas, kachori, pani puri and the list goes on. Some time I will just scoop out little chutney and relish it as it is, ya that’s me. Even use this some times as spread for sandwich that’s delicious too. But then don’t use this sweet chutney for the vegetable sandwich, it doesn’t do justice to the wonderful sandwich that tomato sauce does, this is from my experience, the best thing about this chutney is it can be store for up to a month or may be more than that but then I never use it more than a month if store properly. So here is the simple recipe. 1. Chop pitted dates, pressure cook dates and tamarind for 2 whistles with drizzle some water around 1 tbsp of each. You can pressure cook both together or separately, normally I keep them separate. 2. Once cooker release pressure grind dates into smooth paste, use little water if required. Extract juice from cooked tamarind. 3. In a pan add tamarind extra, dates paste and 1/2 cup water and mix well. Add jaggery and bring it to boil. Now add cumin, red chilli powder, rock salt, salt and mix everything well. 4. Simmer for 2 minutes or until the thick consistency reached, it will be thick like sauce. It’s up to you how you like the chutney to be very thick or little runny. Adjust spice and salt if required. 5. Allow it to cool completely, store in air tight container and you can refrigerator it up to a month. Just remember to use every time clean, dry spoon and scoop out always from one corner and move further rather then using the chutney from all over the bottle/box. ~ You can use sugar instead of jaggery. ~ Add 1 tbsp of raisins for that extra kick. ~ Instead of rock salt you can use chat masala. ~ You can extract tamarind juice as you normally do, let it boil and then add finely chopped dates and cook until it becomes soft and mash while it’s cooking and then follow the remaining steps. I make this chutney this way too. ~ I normally make my chutney thick like you see in the pictures and store. If I need to dilute I just add little water every time I use the chutney. ~ If you don't want to pressure cook then microwave tamarind and dates for 2 minutes in high and extra juice and cook as above. That looks great!Never made chutney with dates..I wud love to try it! Yummy and wonderful chutney !! perfect for chaats !! Imli Chutney luks delicious and a perfect match for all Indian Breads. Chutney is tempting a lot..I'm also thinking of preparing it! super duper yummy and i love these chutneys with chaat!!! Slurp,fingerlicking chutney, love this chutney. Tongue tickling chutney!!! Would love this with garma garam samose!! Perfect with all chaat items, looks superb. Nice post. What a coincidence? Today only one of my friends asked me abt this chutney. I said I'll post soon. Instead I can send your link. Thanks for it. Chutney looks superb. I love imli kajoor chutney! My mom makes this too....great with some samosas! Your looks yum!! This goes well with lot of stuff.. I have this all the time handy..urs looks sooo yummy Priti..